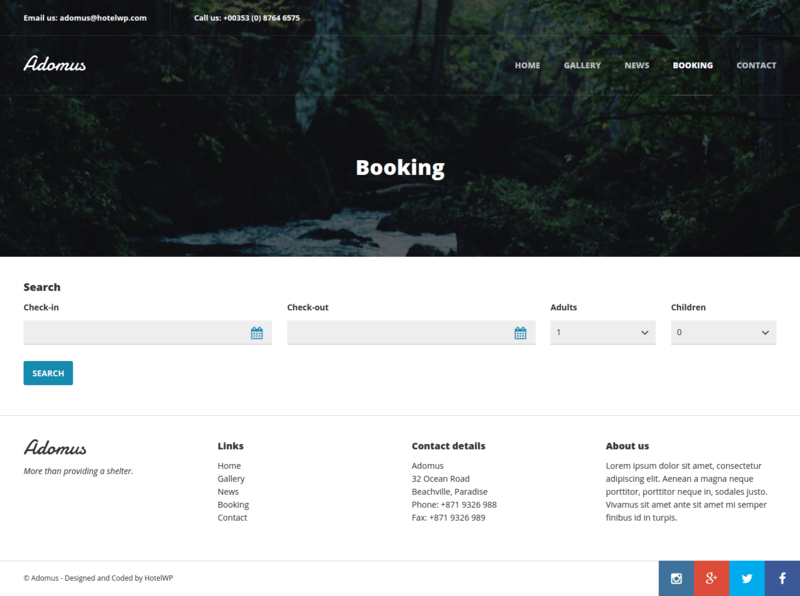 Adomus – It is the WordPress theme which is used mostly for creating hotels websites. The theme is designed in such a way it contains all the features which are necessary for growing your hospitality business. The theme uses clean and modern design, also it has responsive design which looks amazing on any devices, no matter how big or small device you are using, it is flexible to work with any kind say from larger desktops to small handheld mobile devices, improving user experiences. The theme includes contact form if anyone is willing to contact for reserving tables or any other queries, all can be solved. For booking, the booking form is available. The homepage of the theme is designed very beautifully and it helps in attracting the users. It displays the email and contact number at the left top of the homepage for easy communication. various different page templates are created such as page with attractive gallery, contact, news etc. It also contains footer widgets which displays links to go through pages directly, about us section and contact details. The slider is integrated on left side which displays very attractive pictures of houses which can be booked for spending some good quality time with family, friends etc. This theme comes with beautiful design and powerful theme options on activating it. Tried with all customization option and found really great to have same like this for my own website.